The sun is hot, the rain is plentiful and this can only mean one thing: it is summer in East London. And summer means that it is once again time for the annual Kempston Ladies Nite Race! A race which puts the spotlight on the ladies of East London, organised by the Oxford Striders running club and proudly sponsored by The Kempston Group for the last 14 years. On Saturday evening the 4th of March the streets of East London’s suburb Nahoon, home to Kempston’s Head Office and Oxford Striders, turned pink and grey. This was thanks to the stunning two-toned vests which were issued this year, proudly worn by the participants who were lucky enough to get their hands on one. Not everyone, however, got one as the numbers of this year’s race far exceeded everyone’s expectations! Based on last year’s numbers we had estimated around 2500 participants and therefore 2566 shirts were printed. This year’s striking vests, however, caused quite a stir and there was a spike in registrations so much so that two days before the race all shirts were already finished! But, in true Kempston form, our Chairman, Tony Cotterell, decided to have another batch of shirts printed so that nobody would feel left out. The shirts take some time to print so by mid-April there will be many more happy faces in East London, proudly wearing their limited edition Kempston Ladies Nite Race vests. A total of 3345 people entered this year’s race, so we’ll be sure to see many runners promoting the Kempston brand in East London. Something that makes our marketing division very happy! Although the dominant colours on the night were pink and grey, there were many brightly coloured skirts and wigs paraded around, and these were generally not worn by the ladies! To keep it a LADIES race, men are not allowed to join the 10km run but are challenged to dress up as a lady for the 5km race. This might scare off some of the shyer gents, but for the more daring, it’s their one time a year to shine! Where most “wanna-be-ladies” stick to a skirt, some balloons in their shirt and a wig here and there, some of the more extravagant gents raid their wife’s cupboards and show up in the most amazing outfits on the evening. To reward these acts of pure bravery and to entertain the crowd, the “wanna-be-ladies” were invited onto the stage at the end of the prize giving ceremony to show off their stuff. Winners were chosen based on the cheers of the crowds and these were definitely deafening this year! The Kempston Ladies Nite Race has become a family affair with children encouraging their fathers to dress up, wives lending their husbands their bras and bikinis and even little girls showing up with balloons in their shirts. 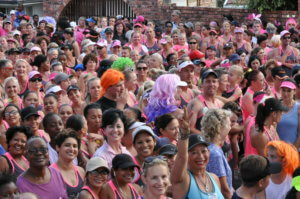 This is not just a race for the female running elite, but a family event enjoyed by the whole East London community. With next year promising to be even bigger and better, we hope to see you there!